View some of the top romantic places to propose in Gettysburg, Pennsylvania. It starts with the Inn's charming rooms, picturesque grounds, packages & location. We offer romantic rooms, romance packages, and an exquisite property for engagements and marriage proposals. Our picture perfect romantic property is the ideal place for an engagement. Battlefield Bed and Breakfast Inn is the premier romantic Inn in the historic Gettysburg, PA area. The Inn has been recognized as a must-see historic Bed and Breakfast in the United States by the Travel Channel and also named a Best Romantic Getaway by Vacation Idea: Dream Vacation Magazine. The Inn's rooms feature charming historical details and romantic features such as Jacuzzi tubs, extra-large rain showers, private entrances, and King size beds. The property's private location in the Gettysburg countryside provides the ambiance of a relaxing oasis; the perfect starting point on your life's journey as an engaged couple. Battlefield Bed and Breakfast Inn offers a variety of romantic locations for proposals on its 30 acre property in the Gettysburg countryside. The Inn offers two historic rooms with working gas fireplaces, two common rooms with fireplaces, and an exquisite wrap around deck that features its own outdoor fireplace as well as comfortable wicker furniture for relaxation. The main farmhouse building is situated in front of a picturesque pond with a beautiful wedding garden next to it. The pond and wedding garden area is a perfect locale for a marriage proposal, perhaps over a gourmet picnic lunch or a long romantic stroll. The Inn's thirty acre property also has walking trails that cover the entire property, another perfect onsite location to surprise your loved one with a marriage proposal. We offer beautiful historic rooms with romantic details such as: extra large rain showers, double soaking tubs, jacuzzis, King size beds, and private entrances. 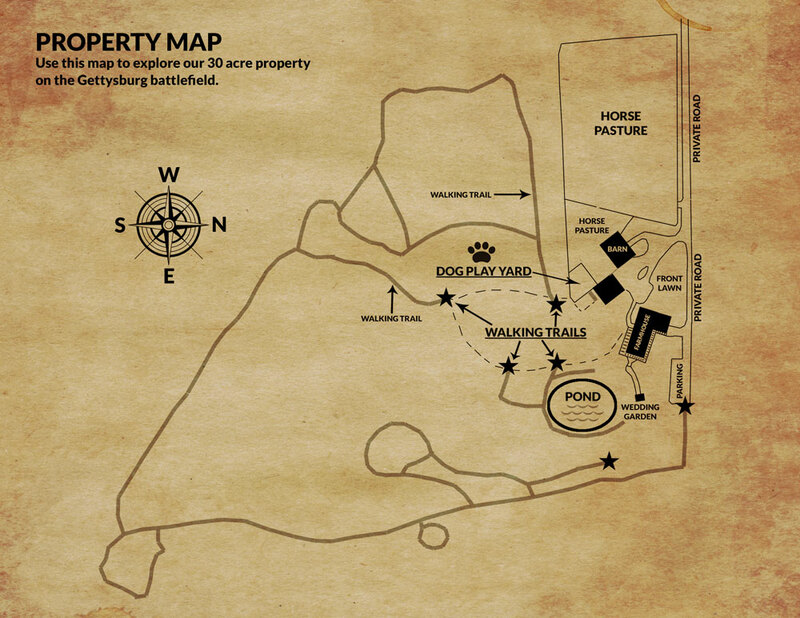 Our picturesque 30 acre property in rural Gettysburg is the perfect setting for a romantic picnic. We offer our own gourmet platters and special amenities to get you started. Adams County has many local vineyards that you can use as a setting for your proposal. We recommend Adams County Winery, Reid's Winery, Halbrendt Winery, and Hauser Estate Winery (pictured above). Gettysburg has many romantic fine dining restaurants to choose from. We recommend the Dobbin House (pictured above), The Inn at Herr Ridge, and Sidney Willoughby Run. Package comes with: a bottle of local Wine, a cheese, fruit, and bread tray including four chocolate dipped strawberries, a bouquet of fresh flowers, and a delicious complimentary breakfast served inside your room.